This sparkly decoration is inspired by the coast-line that surrounds the Isle of Wight. 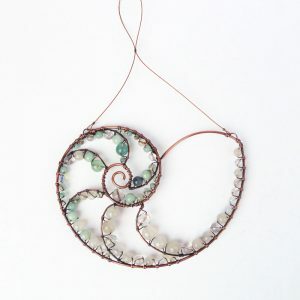 Featuring a hand-made copper wire work seashell that is adorned with oceanic semi-precious gemstones and Czech glass. This over-sized oceanic design would love a sunny spot In your home or garden, filling your space with pretty shimmering sparkles and irridescent reflections all year round. A polished and weathered copper bookmark design with a delicate sea side style droplet of amazonite, labradorite, moonstone, ocean jasper and agate gem stones and glass chips. Inspired by our ongoing love of the British sea side, ocean waves, sandy beaches and rugged coast lines. Our range of rustic hand-crafted bookmarks make the perfect gift for friends, family and colleagues. This necklace is inspired by the rolling waves of the ocean, with white crests and watery colours of greens and blues as the force of the tide stirs up the water. The curvy design is made with copper wire detailing, set with watery sea foam droplets of agate, Chinese jade, amazonite and aventurine beads. This abstract style of copper jewellery is designed to sit just under the décolletage. A rustic weathered copper wire hanging heart decoration with agate, amazonite, sodalite, kyanite and fluorite semi-precious gem stones and glass beads. This heart suncatcher can be hung in the home as wall art or as a sparkly decoration for sunny windows. It is sturdy enough to be hung in the garden to see warm flashes of dancing sea shore rays of light. This handmade piece was inspired by the watery colours of ocean waves and the gently lapping of the sea against the shore. With flashes of turquoise, deep blues and glistening translucence. A striking ocean waves suncatcher with radiant watery gemstones. The colour palette captures the essence of the ocean with watery blues, soft greens, aquamarine, translucent purples, whites and crystal clear hues. This contemporary copper wire hanging decoration would love to be homed in a sunny lounge window or out in the garden for year round colour and sparkly light play. This pair of earrings takes inspiration from the crest of ocean waves, with aqua and white seafoam watery colours that soothe and calm. Hand-made with oxidised copper wire-work, amazonite and Chinese Jade gemstone beads. These earrings are just perfect for ocean dreamers and beach lovers. To wear, the circle/hoop shape sits side onto the ear/face. The last photograph in the gallery shows the front on view. A striking necklace and earring jewellery set that is inspired by summer rain fall, with sparkling rain drops rolling off branches in humid woodland. This design celebrates soft contours, delicate scrolls and bold curves, all wrapped up with a combination of watery and earthy forest semi-precious gemstone beads. A flamboyant style that calls on the essence of nature. This hand-made design is popular with brides and bridesmaids! This oceanic jewelry set is inspired by the rolling waves of the deep blue sea, featuring white crests and aqua swirls as the force of the tide stirs up the water. The design is made with polished patina copper wire detailing, set with droplets of agate, Chinese jade, amazonite, peace jade and aventurine gemstone beads. For beach lovers and water babies, celebrating our love of ocean life! A rustic textured bracelet with copper, natural leather, wood, coconut and a variety of watery semi-precious gemstone beads. Reminiscent of the sea shore, where the coast-line is filled with gentle lapping waves, driftwood, weathered pebbles and beach treasure. The copper feature has been hand cut, filed, textured, darkened and polished. There are little stone droplets that adorn the clasp and dangle freely with movement. We love how the earthy colours of brown leather, shimmering gem stones and metallic coppery tones combine. This beach style bracelet can be worn any way around the wrist, each part of the design has its’ own charm. This plant pot ornament is inspired by the deep blue sea, with rolling waves and aqua sea-green colours. Celebrating my love of the ocean and the coast line on the Isle of Wight, this design is hand-made with copper wire work and watery semi-precious gemstone beads. Bring year round colour to your pot plants, they love to be placed in a sunny spot to radiate glowing sunlight through the beads. These make lovely gift ideas for gardeners and are happy indoors in the warm and outdoors in the garden. This pretty window decoration has three heart shaped hanging ornaments made from copper wire wrapped with agate, amazonite, sodalite, fluorite and glass beads. Hang in your window to see warm flashes of dancing rays of light. This piece was inspired by the watery colours of ocean waves and the gently lapping of the sea against the shore. With flashes of turquoise, deep blues and glistening translucence. Best served with sand, sea and sunshine!